Did you know that you can take advantage of the holiday and seasonal traffic on Pinterest, even if you don’t create seasonal content? Let me share how you can use seasonal content to your advantage. Many Pinterest users do themselves a disservice by only pinning their content. As I’m always telling anyone who will listen, Pinterest is a collaborative platform. That means Pinterest wants you to share others’ content. What better way to make Pinterest happy and improve your own numbers than by sharing seasonal content? Now, don’t run out and pin all the things related to the next upcoming season. You want to be strategic in what you actual pin, even with seasonal content. It’s important to make sure the seasonal content is related to your niche and your ideal client. This benefits you two ways: 1) you’re getting on the seasonal and holiday traffic train and 2) you’re helping your ideal client plan for the event. With those two things, you are in turn attracting your ideal client to your profile! That is huge, yall! I’m personally not in a business where I need to create seasonal content. However, I do suggest ways other business owners can take advantage of that traffic. Just like I did back in the fall when I published this post about Halloween on Pinterest. Also, you never know when a seasonal pin may go viral. I’m never going to turn down a viral pin, even if it is someone else’s content because it still helps my account in the long-run. Here’s an idea I have for those of you that might not create seasonal content but can tweak older content for the upcoming holiday. For example, a Teachers Pay Teachers store owner may take a previous poetry project and update it for Valentine’s Day. This is perfect since February is Poetry Month and Valentine’s Day is right in the smack of it! By updating an existing product with a seasonal twist, you are providing valuable content to your audience. After updating and creating the new Valentine’s Day poetry project, save that pin image to your Valentine’s Day board along with other school-age crafts and classroom decorations. Not a TpT blogger? Think about how this can apply to your own business. What If I Don’t Create Content for the Seasons? Now, if you do not create content related to holidays or seasons at all, here’s an idea for you. Perhaps you’re a fashion blogger and everything you create is related to women’s fashion. While you don’t actually sell items with cute hearts on them, you could put together a Valentine’s Day OOTD Edition for your blog and link those pieces back with your affiliate links. If you do sell super cute heart items, maybe create 10 different outfits using one piece. Offer something for different styles like edgy, classic, preppy, masculine, boho, etc! How fun is that?! Not only can you share these outfits on your Valentine’s Day seasonal content board, but you can also share them to your outfits inspiration board! Cross-pinning for the win, yall! The key here is to add your content in with others’ content so you can serve as a resource to your ideal client. Pinners are planners and are about 45 days ahead of an event. Make sure your seasonal content and holiday boards are up BEFORE the average Pinterest user starts planning for the event. Seasonal content does not just mean holidays. Don’t forget about those bigger, non-holiday events like the Super Bowl, Awards Season, and Back to School. Think about the seasonal events that impact your ideal client or target market the most. If you target mom’s, Back to School is a huge season to take advantage of when it comes to seasonal content. How Do You Prep For Seasonal Content? 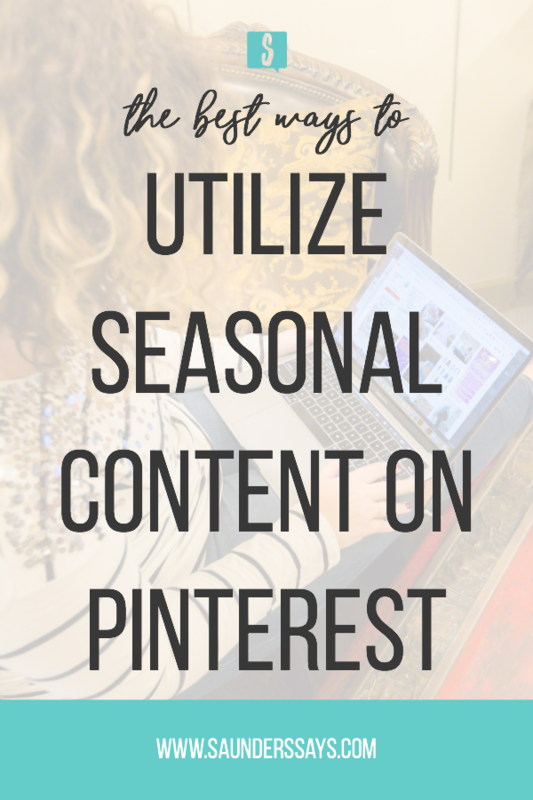 How are you preparing your Pinterest account for seasonal content? I personally have a board for each holiday and season. Check out my Valentine’s Day board here! If you share this post on Pinterest, I might just do a happy dance! « What Are Promoted Pins and Should You Use Them? Interesting subject! I actually just started doing this and have already seen a huge bump in traffic! This is such a great list of ideas! Definitely over hauling my Pinterest! This was very informative to me. I love Pinterest and most of my traffic comes from it. But I have only had my own pins go viral for one specific blog post. I have other pins that get me traffic, too, but not as much. I wish I could really figure it all out. The seasonal idea is great. I was just talking to someone about how I have to be ahead of holidays so when people go to search, my content is there already. Thanks for the tips! So important to keep all this in mind. I loved how you said to refresh and old post to be used for seasons. Wonderfully put.